Workflow actions are used to trigger actions like Sending an Email, Sending a SMS Message, Creating a task or updating a field. You can create as many actions as required. You can also drag and drop the actions into the order you would like them to occur. To set an action for your workflow, click the workflow to which you want to add it, then scroll down to the Workflow Action section, then click New. Step 1 - Give your action a name. Step 2 - Choose if you would like to make your action time based. - If you do not check this option, your action will be triggered as soon as the criteria you have previously configured ate met. Check the checkbox to make your action time based - this way, you can set it to trigger any number of days, hours or minutes before or after an event. (such as a record creation, the date of a notice, etc). 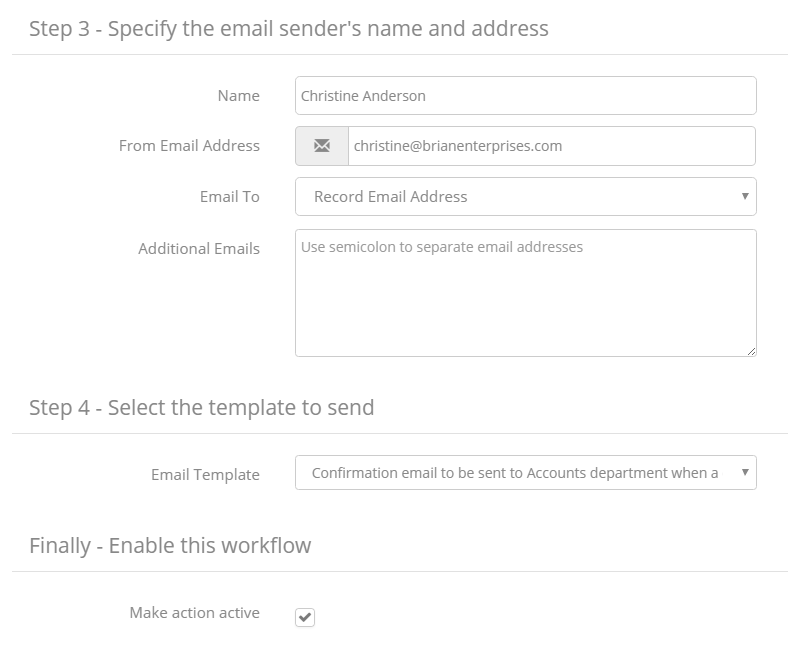 Step 4 - Select the email template to use. This template must be created under Settings > Customize > Templates > Email Templates in order to be displayed here.The Module selected here must match the selected Module/Folder). Finally - Enable this workflow by ticking the box. Save your changes when you are happy with the workflow configuration. IMPORTANT: If you change the Module that the workflow is based on after saving, the template used for the Email alert will be unset. You will need to edit the action and select another.